Bournemouth are away from home for the first time in this season’s EFL Cup as they travel to London to take on Chelsea. Maurizio Sarri has used the EFL Cup to ring the changes in the two previous rounds and it would be a surprise if he didn’t rest a few of the first choice XI for the visit of Bournemouth. That said Chelsea’s squad has impressive strength in depth so the Cherries should not expect to be facing some unknown youth players. Bournemouth have enjoyed home advantage for all three of their EFL Cup matches this season so far – and have not faced another Premier League side before this away trip to Stamford Bridge. Eddie Howe has tended to rest some of his first team for these matches so far, so it will be interesting to see if he continues that practice against Chelsea. 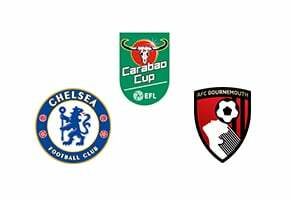 Both Chelsea’s matches in the EFL Cup this season have been passionate affairs. Their third round match was at away at Anfield – and although both starting XIs were not full of regular starters there was enough talent on show for an entertaining football match. Then club favourite Frank Lampard brought his Derby County side to Stamford Bridge in the fourth round and Chelsea were fortunate to get through to the quarter finals. Bournemouth comfortably saw off Milton Keynes Dons and Blackburn Rovers before stumbling past Norwich City in the fourth round. Although the EFL Cup will be way down the priority list for both these clubs they will also know that a win here puts them one step away from Wembley. Chelsea have an impressive amount of back up talent and could win this one 2-1. Chelsea should win this at home but with a defence that isn’t used to playing together there may be enough mistakes for Bournemouth to get on the score sheet. Chelsea have talent in reserve so someone like Ross Barkley may be given the chance to shine against Bournemouth and the betting sites will offer fairly attractive odds on the midfielder finding the net. Chelsea beat Bournemouth 2-0 in the league in September and also knocked the Cherries out of this competition last season. Chelsea beat Bournemouth 2-1 at the very same stage of the EFL Cup last season. Willian and Morata scored for the home side in that game. Bournemouth have reached the quarter final of the EFL Cup for the second successive season, after only reaching this stage once in their previous 57 appearances in the competition. Chelsea have won the League Cup on five occasions – most recently in 2015 when they beat Spurs 2-0 in the final. Bournemouth are the only Premier League side left in the EFL Cup that have never won a major trophy in their entire history.